I walked along Horseshoe Pond this morning and noticed the crab apple tree by the pond. I thought I may have already blogged about the crab apple tree at my grandparents’ (LaValley) house, but couldn’t find the post. My grandparents lived on 98 Washington Street in Penacook and had a huge crab apple tree in the back yard. The tree is still in the yard. In the spring, it has the most beautiful blossoms. In the fall – it used to be full of sour but delicious crab apples. When I was young – I would eat them raw. I didn’t mind that they were sour. Come to think of it – I used to eat rhubarb raw as well. It must be because I am so sweet that the sourness didn’t bother me! Ha Ha Ha! I remember the delicious crab apple jelly that my grandmother would make. It was not too sweet and was spiced with just the right amount of cinnamon. It mad the best peanut butter and jelly sandwiches! It was great on buttered toast as well. I made my own batches of jelly too, in my younger years, with apples from that same tree. There is nothing like the aroma of homemade jelly being made. I used to enjoy making jelly. I also remember my mother and Aunt MaryJane making jelly together in the kitchen. I used to love pouring the hot wax over the top of the jelly. We used old jelly jars, baby food jars, and any other kind of jars we had around the house. It was a lot of work. I am sure the folks who live in the house would let me have some of the apples – but I am too lazy. I would say too busy – but that really isn’t the case. Lazy fits. Considering my waistline – it is probably best that I don’t make my own jelly. It would be too much of a temptation. If my family has one weakness – it is the love of good food and especially comfort food. 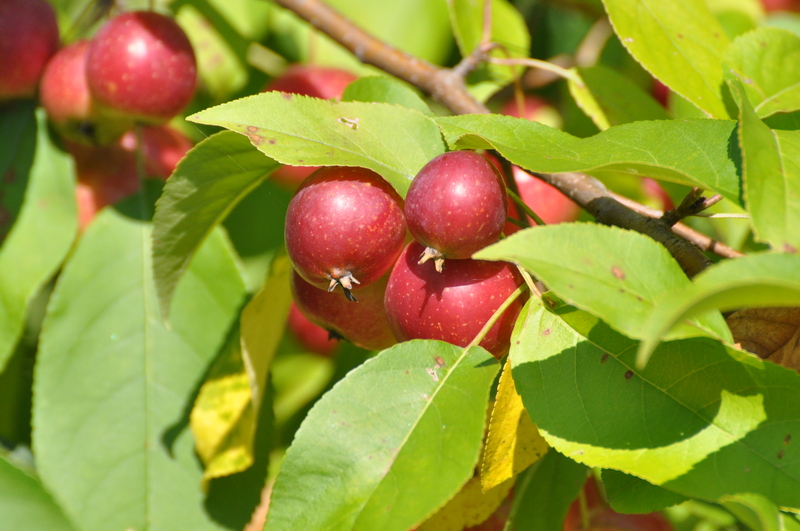 I have seen homemade crab apple jelly in local orchards and a farm store. I think I will pick up a jar or two and as long as I don’t buy a loaf of bread and a jar of Skippy peanut butter at the same time – it may last a while. Happy Harvest everyone!